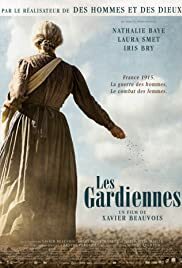 LES GUARDIENNES (THE GUARDIANS) is director Xavier Beauvois’ (LE PETIT LIEUTENANT) handsomely mounted period piece of World War II told during the period of 4 years from 1916, the start to end. It is a story that needs to be told – of what effects the war as well as modernization had on a typical farm family in France. The women of the Pardier farm, under the deft hand of the family’s matriarch (Nathalie Baye in arguably her best role), must grapple with the workload while the men, including two sons, are off at the front. Her husband, daughter and , grand-daughter remain with her. She seeks the aid of an outsider, a strong 25-year old orphan, Francine (Laura Smet) who turns out to be an excellent worker. When Francine and on of the sons fall in love, the trouble starts. Beauvois’ film is almost perfect in he creation of the war atmosphere and of rural France. The harvesting and planting seasons are beautifully captured on film. The film also does not gear towards the typical Hollywood ending but a realistic credible one instead. It is finally here and the world is waiting to hear how good (or bad) the $200 million production of the new Star Wars film is. For one, the filmmakers are clear to emphasize that this is a standalone story. By this, they mean that the story, set shortly before the events of the original Star Wars, is not part of the other STAR WARS films, though there are already two more films after ROGUE ONE in the making as ROGUE ONE is the first of three anthology films. There is not much original in the story of ROGUE ONE. But there is little to disappoint. Again, the film begins with the title, “Long time ago in a galaxy far away..”, though the words are differently laid out. The scriptwriters Chris Weitz and Tony Gilroy, from a story by John Knoll and Gary Whitta ensure the successful formula is untampered with. And there are lots of spectacle, new characters, explosions, exotic futuristic sets combined with exotic setting – space towers emerging from a tropical paradise. At times, the film feels like a James Bond film, where the hero and troops storm the villain’s lair, take him out while blowing everything up. It all starts with the escape of young Jyn Erso as a child as she witnesses her mother shot dead and her inventor father (Mads Mikkelsen) taken away to create a planet destroyer for the Empire. With this weapon, the rebels would stand no chance of winning the battle for the galaxy. So, the Rebel Alliance recruits the grown up Jyn Erso (Felicity Jones) after freeing her from prison, to work with a team including Cassian Andor (Diego Luna from Y TU MAMA TAMBIEN) to steal the design schematics of the Empire’s new superweapon, the Death Star. That is about it for the story, leaving the film plenty of time for action, spectacle and more action and more spectacle. Music is by Michael Giacchino with pieces taken from the original score by John Williams. The enmity between Cassia and Jyn inevitably turns into romance. But the romance is executed in good taste without distraction from the action at hand. The two are just shown holding hands in the key scene. The choice of a female protagonist heroine as in the last STAR WARS film last year is a good one, given these politically correct times. After all, Princess Lea, a key Star Wars character is female and key to the whole saga. The main villain of the piece is played with sufficient relish by Ben Mendelsohn next to the odd appearances of Darth Vader. But the new characters that steal the show are played by Donnie Yen and Jiang Wen. Have the Chinese taken over? The new droid K-2SO,(Alan Tudyk) a Rebel-owned Imperial enforcer also makes a new welcome non-human hero. As in last year’s THE FORCE AWAKENS, reviewers were asked not to reveal plot points or twists. In THE FORCE AWAKENS, these included the death of Hans Solo and the end appearance of Luke Skywalker. In ROGUE ONE, there ares equal surprises to please the fans. If you want to stay in cinema, you either have to go very very big or very very small or if you want to go into the movie business that I thought I was leading myself towards, you have to go into television in America now, which is probably the best stories and the best acting and the most interesting material — a lot of it’s on television.